There is no question that This Is Us is currently the best show on TV. After an outstanding first season that follows the adventures of three siblings, Kevin, Kate and Randall and their parents Jack and Rebecca Pearson. The show takes place in the present and successfully uses flashbacks to show the family during key moments in their past. Kevin and Kate are the surviving members of a triplet pregnancy. THey are joined by their brother Randall who is adopted by the Pearsons who was brought to the hospital on the same day that Jack and Rebecca lost their third child. The series is best known for the incredible work done by its actors coupled with some of the best scripts ever seen in network television. 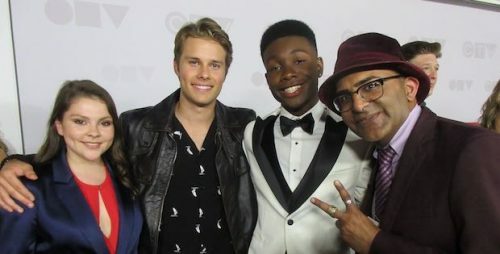 At CTV’s 2018 upfront presentation, I caught up with This Is Us‘ Hannah Zeile, Logan Shroyer & Niles Fitch. I asked the teenage actors if they were surprised by the show’s initial reception and popularity. I asked Hannah about the camaraderie on set and if the older castmembers offer the younger ones any advice. I asked the teenagers about the pressures associated with starring on a hit show at such a young age and if they worry that these characters will be hard for them to break away from. This Is Us returns on Tuesday September 25 at 9:00 p.m. on CTV.